It was my first wedding for 2017 and boy was it going to be HOT! 36 degrees made for BEAUTIFUL weather for Ali & Jake’s wedding out at Sandstone Point, Bribie Island. I got in touch with Ali & Jake back in September last year – after they were referred to me from Laura at Laura Tuton Photography. They are such a cute couple together. With Ali’s particular keen eye for detail, she knew exactly what she wanted – and what she envisioned. They told me that they wanted it to be Special, Fun, and Memorable, and Exciting/Fun, and maybe some Tear-Jerker/Romantic stuff as well! Their wedding held at the beautiful Sandstone Point Hotel, Bribie Island made for a stunning location – as they both loved going to Bribie Island whenever they could. They chose Sandstone Point because it’s ‘their place’. It’s always somewhere they could lay back. I had the pleasure of working with their Uncle – Rick, who was also MC with me throughout the day & evening. 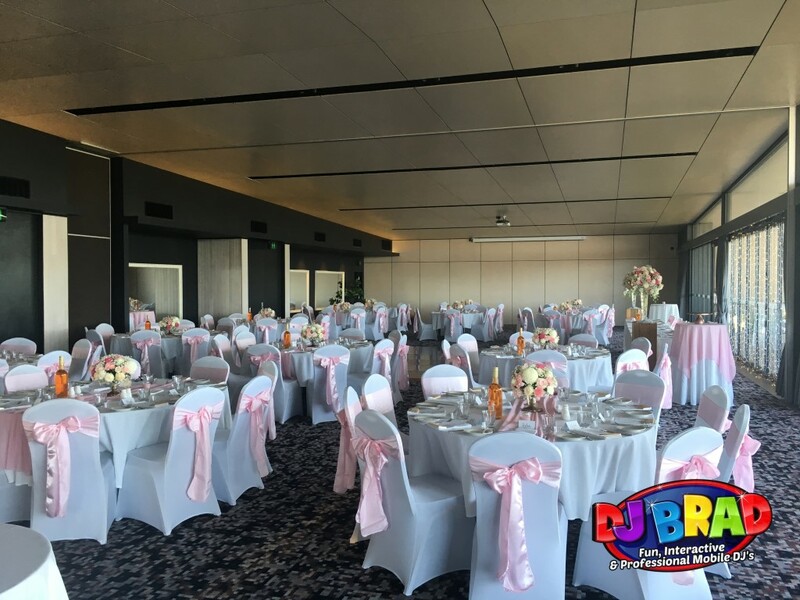 I arrived about 12:00pm to start setting upstairs in the venue for the reception, and checked in with the Function Manager Sonya to go through everything with them – and while setting up we co-ordinated a few things that were going to be happening later on in the evening as well. The room looked amazing! Especially with that view of Bribie Island waterfront. After setting up, I went through and did a few sound rehearsals and checks, along with helping Uncle Rick with some MC warm ups as well. It wasn’t long until this Wedding Reception was ready to go and get started. Guests made their way inside to the room and found their seats, and once Ali & Jake’s Bridal Party were back from getting some photos out & about it was time to invite them in. Each Bridal Party member had their own song to come into, which made for a really fun entry, along with Ali & Jake picking out their favourite song too. Courtney came into…… Len – If you steal my sunshine. After welcomes & introductions from both myself & Rick, the night got started! Guests enjoyed themselves to the Photo Booth provided by In the Booth – doing a number of different fun Videos, Photos & signing on their Guest Book, along with a few country dancing songs throughout the night – that Jake & his friends were big fans of. There was a beautiful Father & Daughter Dance with Ali & her dad, to the song Sweet Child Of Mine which is a Guns & Roses cover sung by Jasmine Thompson. After the Bridal Waltz – Guests danced all thew way through to the end of the night right up until 12:00am when the wedding came to a finish and Ali & Jake headed off.